Ideal for maintaining comfort in areas that are subject to cold drafts, such as vestibules, foyers, stairwells, etc. 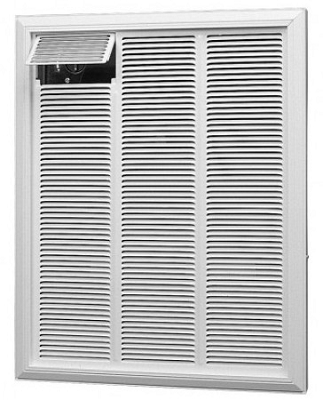 Automatic fan delay utilizes residual heat when unit cycles off. Recessed or surface mounting - ceiling or wall. Exclusive aesthetically pleasing front panel trim. Access door can be locked for tamper-proof applications. Polyester epoxy powder coat painted finish. Front panel constructed of 20 gauge steel. The wall box is designed for recessing into either frame or masonry walls and contains knockouts for wiring connections. Nickel chromium heating element within a steel sheath. Spiral steel fins are firmly brazed to the surface to provide excellent heat transfer. Fan motor is totally enclosed and factory lubricated complete with a black anodized 5 blade mixed flow aluminum fan. The fan delay is a bimetallic snap action type. Standard double pole built in thermostat with provision for low voltage relay and remote wall stat if required. RFI Heaters are also suitable for use with a remote line voltage wall thermostat. All motors are resilient mounted and have built in automatic reset thermal overload protection. Motors have plug in electrical connection for ease of service. Motor and blowers are mounted as a single assembly with direct drive connection on a rigid heavy gauge frame to prevent vibration. The blow through design assures quiet operation and provides maximum cooling for the blower motor.